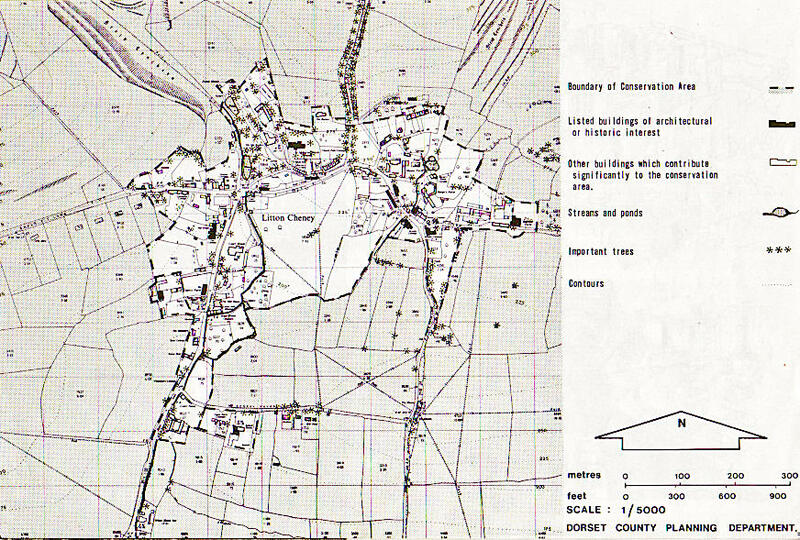 The following is a reproduction of a pamphlet issued by Dorset County Council in 1972, giving details of the Litton Cheney Conservation Area, plus a revised (2003) map, taken from the first WDDC Local Plan. The latter shows the Conservation Area (slightly changed to include Garden Close) together with a “Defined Development Boundary” and “Land of Local Landscape Importance”. No development was to be permitted outside the Defined Development Boundary and only limited infilling inside it. This idea was dropped when the Local Plan was subsequently revised. The 2003 map also indicates that the whole area shown was of Outstanding Natural Beauty. It is included on the website for interest only. It is not known whether all, or any, of its content still applies. Anyone needing up to date details should consult West Dorset District Council’s Planning Department as, since 1972, they have taken over responsibility from Dorset County Council. It is interesting to note that in 1972: • Manor Farm, Barges Farm and Baglake Farm were still in use as intended. • Manor Farm and Baglake estates did not exist. • There was no playing field. • Garden Close was not there. • Fry’s Yard had not been built. • The Garage and its associated bungalow were still there. By 2003 this had all changed. INTRODUCTION 1. The Local Planning Authority has designated much of Litton Cheney as a Conservation Area under the Civic Amenities Act 1967. In view of the recent installation of a sewerage system in the area, which is giving rise to pressures for development in the village, the following policy document has been prepared, dealing with both conservation and development. 2. Long-term policies for this and other villages will in due course be incorporated in a County Structure Plan; the following is intended to cover the interim period. It is put forward as a guide to the control of development. BACKGROUND 3. SETTING.Litton Cheney is a spring-line settlement along the northern margin of the Bredy Valley, at the foot of the chalk scarp, just off, and 145m (500 ft) below the A35 trunk road.The village lies within an Area of Outstanding Natural Beauty, some 14½km (9 miles)west of Dorchester,10km(6 miles) east of Bridport and about 5km (3 miles)from the sea at Bexington. 4. PRESENT SITUATION. The mid-1971 civilian population of the parish was estimated as approximately 210 and that of the village 180. In addition to 87 dwellings existing in the village, there were outstanding planning permissions for seven more. (Note: The number of persons present in the Parish on Census night, 25/26 April, 1971, was 190) 5. FACILITIES. The village contains the parish church, post office, general store, public house and youth hostel together with a forge, builder's premises and a firm manufacturing precision components. There is a primary school which also serves Puncknowle, Swyre, Kingston Russell, Long Bredy and Little Bredy. There is no village hall or public playing field. 6. SERVICES. Main drainage has recently been installed as part of a self-contained scheme covering the parishes of Litton Cheney, Puncknowle and Swyre; it allows for an increase in permanent population, together with a considerable summer population. Water supply and electricity are both available, but there is no gas supply. 7. COMMUNICATION. The village is served only by 'C* class or unclassified roads. There are at present two buses a day to Bridport, two additional ones on Saturdays and one a week to Dorchester. 8. PHYSICAL CHARACTER. The village consists of dwellings built mainly of local grey stone with a yellow or red tinge, and roofs are slated or thatched; brick has been used for chimney stacks and porches. The fine church with its new rectory stands on a knoll above the village. The buildings abut onto lanes which follow no regular pattern, and the whole character is enhanced by roadside streams and associated stone walling, by the numerous trees which provide background and screening,and by the magnificent hillsides above the village. PROBLEMS. 9. The main planning problems arising from the present situation are:- a) Following the installation of main drainage there is pressure for development which, unless it is carefully controlled, will seriously affect the character ofthe village,the greater part of which is considered worthy of S b) The existing road system is inadequate to cope with more than strictly limited development in addition to what already exists. c) Steeply sloping land restricts development at the northern end of thevillage and development elsewhere may intrude into the surrounding landscape which is of the highest visual quality. PROPOSALS A. VILLAGE POLICY 10. NEW DEVELOPMENT. A limited amount of residential development will be permitted on individual sites withiq the main built-up area of the village. It is considered thatsome 25 dwellings could be developed in the courseof time,the majority being in thenorth and east of the village where development will be least obtrusive. Prospective developers should consult Dorset Water Board before submitting an application, to ensure that local sources of water are safeguarded against pollution. Sites will, If necessary, be reserved for a village hall and public playing field in the north west corner of OS 1856 with access from the western side of Court Cottage. 11. EXISTING DEVELOPMENT. There are two developed areas which substantially depart from the established village form and intrude into the open countryside, i.e. Chalk Pit Lane and School House Lane. No further extension will be permitted in these areas, and they should not be taken as a guide to the form of future development. 12. CONVERSION. Favourable consideration will be given to suitable conversions of some of the existing stone built farm buildings within the confines of the village. B. CONSERVATION POLICY 13.1). Within the conservation area it is the policy of the Local Planning Authority to protect and preserve all those buildings, open spaces, trees, views and other aspects of the environment that together make up the character of the area, 2). The demolition of buildings listed as being of special Architectural or Historic interest will normally be resisted. The demolition of buildings in the supplementary list and the demolition of other buildings which contribute significantly to the character of the conservation area will similarly be resisted. 3). The characteristics of each site shall be exploited to the full including aspect, views into and out, gradients and existing trered before an application is considered. Attention should be paid to retaining the visual dominance of the Church, and open views southwards. New roads in the village shall reflect its rural character. 4). Applications for new buildings and applications for alterations to existing buildings will be considered on their merits, having regard to the County Development Plan, this policy statement and any other relevant policy statements as may, from time to time, be promulgated by the responsible authority. The following design criteria will be applied:- a) The position of the building on its site shall be determined by its relationship with adjoining buiIdings and/or open area. b) The materials to be used shall be appropriate to the area and sympathetic to the adjoiningbuiIdings. c) The mass of the building shall be in scale and harmony with the adjoining buildings and the area as a whole. d) The design of any alterations to existing buildings shall be such that the proportions and details relate to and are appropriate to the existing buildings. e) Detail drawings of door and window openings, etc., will be required where appropriate. f) Wherever new buildings and alterations to existing buildings are permitted the highest possible standard of design will be required. g) Whilst it is recognised that in some cases it may be necessary to reproduce exactly a historical style of architecture, the Planning Authority will encourage building in a modern idiom in sympathetic relationship to the surroundings. h) The Local Planning Authority will require the submission of detailed plans with applications for development within the conservation area. i) Changes of use which are likely to have an adverse effect on listed buildings, buildings on the supplementary list, or other buildings which contribute significantly to the character of the conservation area will not be permitted. j) Proposals which, in the opinion of the Local Planning Authority, would affect the character or appearance of the conservation area will be advertised and the Authority will take account of any representations received. k) In exceptional circumstances it may be necessary to consider the relaxation of regulations and standard requirements where these are in conflict with the conservation policy. l) Where applicable, tree planting will be encouraged and, in such cases, the authority will expeces and hedgerows. An accurate landscape survey including these features will be requit a landscape scheme to be submitted as part of the application.